The fact that the first ones look as good as the new ones, even after all the storms we’ve had, is what I love the best about the Wishing Tree. 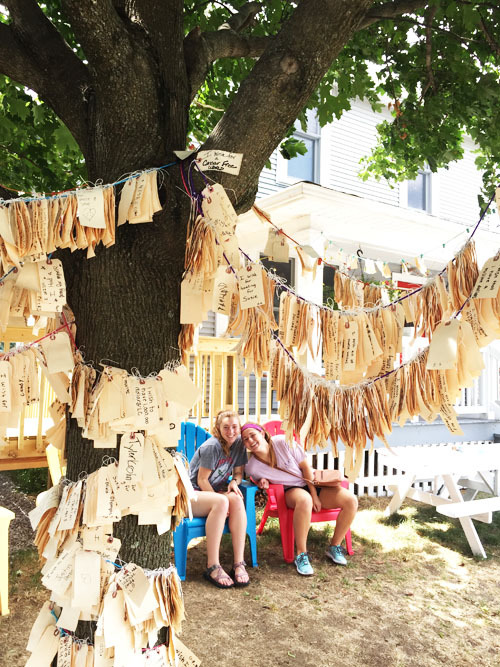 This magical tree grows outside of a candy store, just a few miles north of here, where even kids and teens are compelled to put down their smartphones and pick up old-fashioned pen and shipping tag to write a wish. We are so quick to carry wishes around in our heads, as we work, brushing them off without catching them. Yet, writing them down gives them a power beyond our own ability to make them real. So, what would you write? For all the world to see? If you zoom in, you can see a very special wish two girls made for me… for healing. I wonder what wish you would make? I think, now that school has started, I’m going to get the boys new journals, and tell them to write down their wishes, along with every great outcome they want, for every problem they have. Keep adding… keep stringing together the words, and pray… and by the end of the year, let’s just see how remarkably everything worked out better than you imagined. The journals are really a selfish move, on my part. Because if they are catching their wishes, and turning them into prayers that can actually be answered, it’s one less prayer I have to add to my list. Or, at least in theory… because I’m sure I won’t be able to resist the chance to pray for every one of their wishes — that they get the best.